It’s a testament to Telltale Games’ skill as developers that they’re able to continuously craft interesting and believable characters. Very important for a franchise that thrives on character drama such as The Walking Dead. Last year’s inaugural season delivered spectacularly on this front. Everyone – from regulars to one-off individuals – felt real, relatable. But Telltale also had five whole episodes to build them through, for players to establish a connection with them. 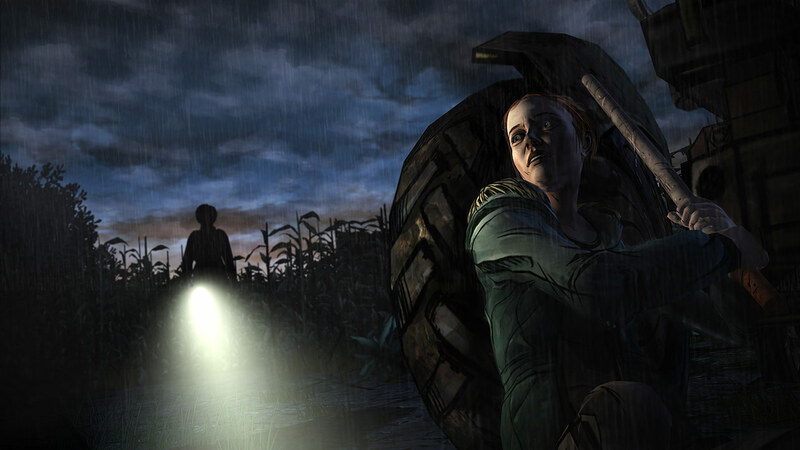 By contrast, the latest episode, The Walking Dead: 400 Days, is but a bundle of short-stories. Each follows one of five new characters briefly, granting limited time to establish and develop them, their vignettes ending almost as soon as they began. Despite this, 400 Days still manages to create connections, the cast just as endearing as the last. Vince, a convicted killer; Wyatt, an average guy road-tripping across the country with his stoner friend; Shel, a young woman acting as a mother figure for her kid-sister Becca; Russell, a high school student on the lam; and Bonnie, a recovering drug addict, star. Their stories take place at varying intervals during the first 400 days of the zombie outbreak, all connected to one another in subtle ways; most obvious being the gas station around which every vignette takes place, the only constant between them. 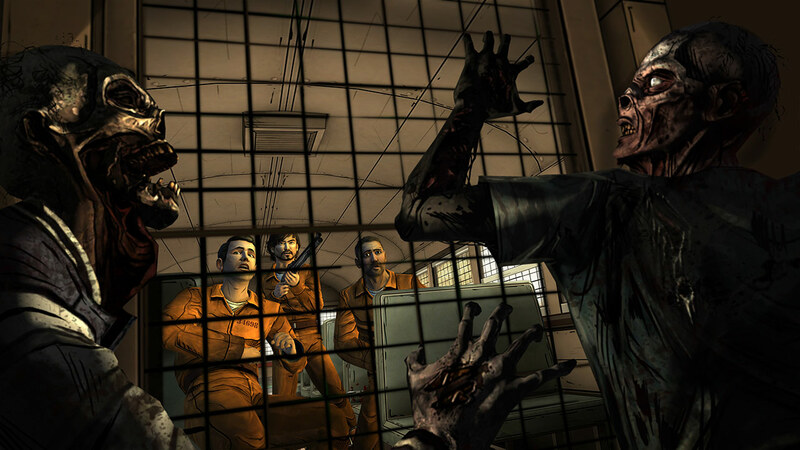 Getting stuck on a prison bus while shackled is hardly the place you want to be during a zombie attack. It’s a well-written cast. Everyone is clearly developed and interesting, their backgrounds deftly touched upon without being forced. You get a good sense of the kind people they are, your choices further shaping them to be sympathetic or contemptuous. Can’t forge strong bonds with them due to the short time spent with them, of course, but they manage to at least invest you enough in them to want to see their travels through to the very end. The tales last about 20 minutes per character, their contents lean and focused. You’re given little agency over the characters movements, many of the stories almost completely on-rails by rarely granting direct control. Dialog choices act as the primary means of involvement almost exclusively, as such. Occasional action scenes punctuate the drama, bringing additional suspense to the proceedings. 400 Days doesn’t rely so much on trial and error for these sequences, thankfully (fighting against zombies in season one comes to mind), the game far less demanding on what it asks of you, preventing it from being dragged down by needless frustration. The choices you’re forced to make are still gut-wrenching as ever. Each narrative only has one major decision that affects the overall narrative, and they’re as difficult as ever, often dealing with life and death. Sacrifices must be made, and you’re always charged with making the call. A hard enough task when working with a well-known cast of characters. Because you knew them, cared for them, so when it came time to side with or off someone, you could make an educated choice, guess the consequences, and whatnot. Eased the impact. As always, it’s their fellow humans who turn out to be the real threat, most of the time. With 400 Days, not so much. You’ve only just met the characters in each story. You may have a good sense of their character by the end of each narrative, but not enough to gain any strong insight as to their future or the potential blow-back for your choices. Gut-reactions fuel actions more than ever, therefore, never able to make anything remotely resembling a logical, carefully considered decision. You’re constantly working with the unknown, every factor a total mystery. Makes everything far more nerve-wracking. That uncertainty makes up a good deal of the brilliance of The Walking Dead: 400 Days. With season two on the horizon, kicking things off with a brief peak at what’s to come is the perfect way to begin this new arc. The scene has been set. All we can do in the meantime is wait and speculate what the future holds for the series.